There is a wide range of cute small OLED (organic LED, aka. Organic Electro-Luminescence) display modules around. Adafruit has a range, the same or similar can also be found all over eBay and Amazon, and of course from DealExtreme. 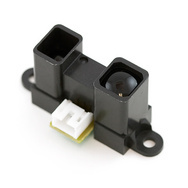 They are available in modules for the Arduino, Raspberry Pi, or other micro controllers. Some are based on basic DATA, CONTROL, LOCK interfaces, while others implement the SPI or I2C bus protocols. The OLED makes for a bright high contrast wide viewing angle screen. Most are monochrome, while a few come with 16 bit colors. I got the $7 0.96 inch 128*64 pixel I2C version from Deal Extreme. It is indeed small, but also very nice and sharp. Even small fonts are easily readable. It was easy to get up and working with the Arduino UNO, although with a few gotchas to watch out for. The I2C interface makes it very easy to hook up, with only two wires in addition to power (5V and ground). For background, this GeekOnFire page goes into detail about the memory addressing and low level commands. Further details can be found in the Univision Technology display (UG-2864HLBEG01, UG-2864HSWEG01) and Solomon Systech driver chip (SSD1306) data sheets. See also this note which compares the SPI and I2C protocols. There are also multiple drivers and graphics libraries around, some of which are available directly through the Arduino IDE Library Manager. I’ll go through the details below, but before we get there, make sure the module is hooked up correctly and detected. See the Arduino Wire library reference for which pins to hook up. It varies based on Arduino board and version. Note, for the Arduino Uno, the pins are Analog 4 and Analog 5. Once plugged in, copy the sketch from this simple I2C Scanner, and upload. Open the Serial Monitor, and observe something like “I2C device found at address 0x3C“. Take great care to note the exact address. It might be either 0x3C or 0x3D, and the libraries below will have to be modified accordingly. The U8glib library supports a long list of different LEDs. It is available directly from within the Arduino IDE Library Manager by searching for “U8glib”. Once installed, open the Examples list, and try the “HelloWorld” example. 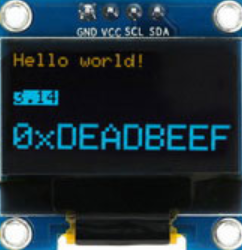 Once uploaded, the display should show “Hello World!”. Also try out the other examples, like the GraphicsTest, but make sure to always uncomment the correct initialization line. 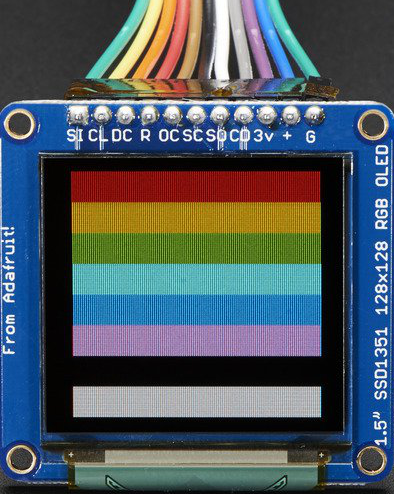 The Adafruit library focuses on the displays they offer, and comes in two parts, the SSD1306 driver and the Adafruit Gfx library. Searching for “Adafruit SSD1306″ and “Adafruit gfx” in the Arduino IDE Library Manager should give perfect hits. The Adafruit driver and examples take some custom modifications before they work, though. First, in the file Adafruit_SSD1306/Adafruit_SSD1306.h, make sure the following lines are uncommented and correct according to the display you have (see the scanner section above). Make sure the other similar lines above or below are commented out. Finally, the GeekOnFire library is yet another easy wait to get started with the OLED display. It is not available in the Arduino Library Manager, but can just as easily be downloaded from their site, and installed from the Arduino IDE through its ZIP file. Various items ordered from DealExtreme. A few months ago I listed what I’d bought and looked at on the Hong Kong based site DealExtreme. Here’s another overview, with more electronics and random stuff. Disclaimer: All links are redirected to dx.com with my affiliated ID. 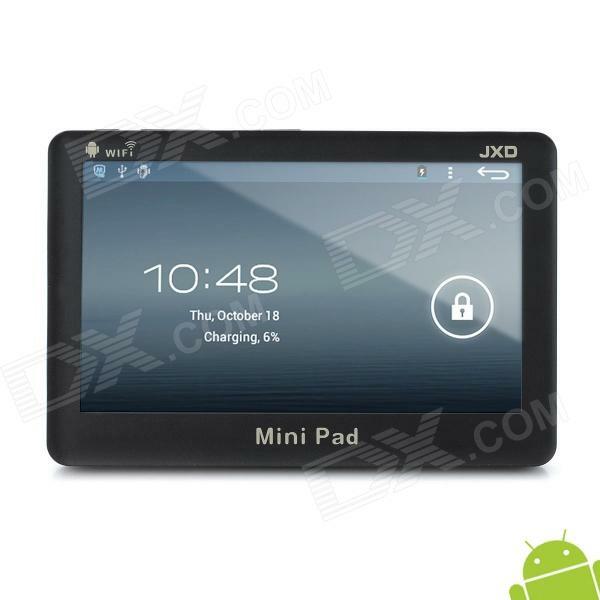 Tablet, tablet on the wall, what’s the cheapest of them all? That question comes up from time to time, so here’s the cheapest I could find at Deal Extreme. Please see the customer reviews for each product for details. And remember, you get what you pay for. At that price, it will work, run the browser and basic apps, but don’t expect “the gadget of the year”. DealExtreme / dx.com is a Hong Kong gadget site with thousands and thousands of China products of all kinds, often at very competitive prices. Every order is free of shipping charges, even if you buy a $1 item. It makes it easy to order and forget. The only downside is the shipping time, which sometimes can be around three to four weeks; some things might arrive earlier, though. Here are the items I’ve bought for myself and others so far, followed my wish list, or list of items which might be interesting. The order list can be download in CSV form, while the wish list had to be scraped. For what it’s worth, here is a small Python script which does that, plus a bash script for HTML rendering of image links and product descriptions. In yet another shipment from Deal Extreme, I picked up a HC-SR04 Ultrasonic Range Finder. It seems to be a widely used and supported component, as there are plenty of posts around, and several supporting libraries for Arduino. Usage was also dead simple, and accuracy and responsiveness is good. One data sheet claims 2 – 500 cm ranging distance, at a 0.3 cm resolution, while another mentioned only 4 meters. The results I’ve gotten seems to be in line with that. The only problem I sometimes detected, is that it will not always handle a sudden change in distance very well. Or possibly not detect the echo signal if facing a distant surface at a slight angle. However, even so, I find that it fails gracefully. The Ranging function above will output a “out of bounds” number (around 2400 cm) when it cannot detect an echo. It means there is a very clear boundary between valid readings at 2 – 400 cm and “failure code” at ~2400. The next step, is now to mount this on to the model helicopter I just got, and see what we can get from there. Initially as a separate and independent payload, I assume, but maybe later integrated with the main control board for the motors. For completeness, I’m including the two functions in the library above. As mentioned, it’s simple, and just implementing the timing functions described in the above data sheet. On a related note, there are plenty of range finders around, rated for different ranges and resolutions. 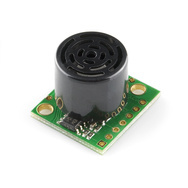 Sparkfun has the Maxbotix ultrasonic line, as well as the commonly used Sharp IR Proximity sensors. The later are available in a wide range, from several retailers. Just got my first order delivered from DealExtreame today, and must say I’m very happy with the whole experience. Some claim that shipment is slow, however, from order to delivery, it took 15 days in this case (only 11 of which was for shipping from China). Very reasonable, in my opinion. The order was for a USB Barcode Scanner, of type XYL-820. Again, I’m very impressed with the quality. It is a professional tool, highly configurable, comes with detailed low level documentation, yet is very easy to use. 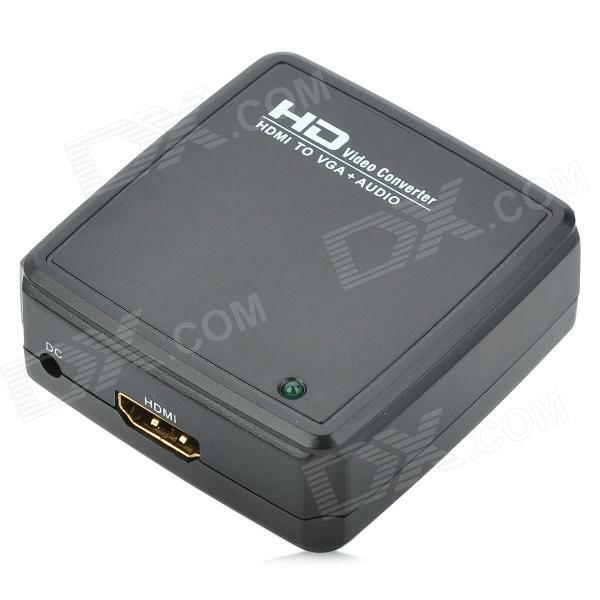 Just plug & play; it is detected as a keyboard device, and start scanning. All options can be configured through scanning of special bar codes which are printed in the manual. Through them you can easily turn on or off sound confirmation, carriage return, encoding, etc. The device was detected without problem under both Fedora and Ubuntu. The goal is to use it for my CD database. Having the bar codes will be useful once my catalogue is complete. Then I can scan CDs in the shop, see which ones I’ve already bought, which ones I’m missing, and so on.